Jacqui Smith, the Home Secretary, today announced an extra 300 police officers to fight terrorism and radicalisation within communities. Miss Smith said that the new officers work to prevent young people being drawn into extremism. The threat to Britain was “serious and growing” and, despite a series of successful raids and convictions, we cannot simply “arrest our way out” of the problem, she said. “We need to prevent people from becoming terrorists and supporting terrorists in the first place,” she said. 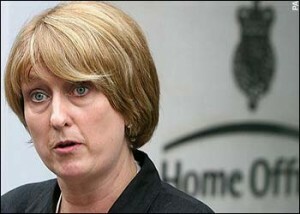 Miss Smith said that police officers could help other community groups to prevent young British Muslims being radicalised. The 300 positions are new and will be funded by £11 million announced in last year’s Comprehensive Spending Review, she added. In a speech later today, the Home Secretary will say: “We need to dissuade that very small minority of people who wish to harm our communities from becoming or supporting terrorists. That is the long term challenge. At the weekend, Miss Smith warned that as many as 30 active plots against the UK were now being investigated. The Government is trying to build support for controversial plans to extend the time limit for holding terror suspects without charge to 42 days. Downing Street has denied claims that it is facing a cabinet and backbench revolt over its plans to extend the detention limit.